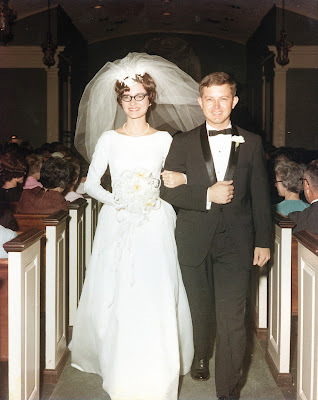 Next month Hubby and I will celebrate 49 years of marriage. We had not seen my wedding dress since our wedding August 26, 1967. After the wedding, my mother had thoughtfully looked into a local dry cleaners’ advertisement to clean and secure wedding dresses in a “treasure box” that would maintain them in pristine condition. And so it resided in its treasure box on the top shelf of the closet in my former bedroom until 2009. The dress then took up residence in our home, still unopened in its treasure box. Hubby found the box as we were sorting what to take to our new house. 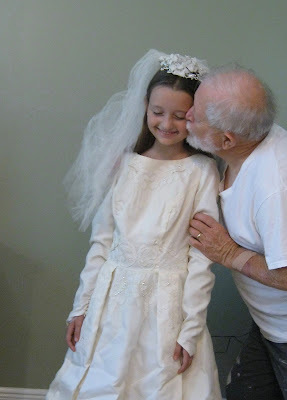 He wondered had my wedding dress crumbled to dust, fallen apart or remained in good repair. “Do you want to open it?” He left the decision to me. The day came. Anticipation thrummed through me as Hubby and DIL Sarah worked at unpacking the box. And there it was. Our wedding photos have faded with time, and I had forgotten how pretty it was. There were, however, signs of aging. The thread that secured the seed pearls adorning the bodice had failed in places, and some of the tiny pearls were missing. There was also a brown discoloration in a fold along the hem. We had assumed that Katrina’s wind and pine tree through the roof at the back of Mother’s house in 2005 had not damaged the front rooms, but maybe water had found its way into that box. The seams, however, were in great shape. “Could I try it on, Nana,” she asked, eyes wide. Granddaughter tugs at this grandmother's heart. I teared up, snapped photos and cried some more. “Yes, that would make me so happy. But only on two conditions,” I said. “One, you can’t run off and get married, or have a quick wedding, because there are some repairs and alterations that would need to be done. Charlie loves designing, shopping for fabrics and sewing, from dresses to ponchos. And she has never used a pattern. 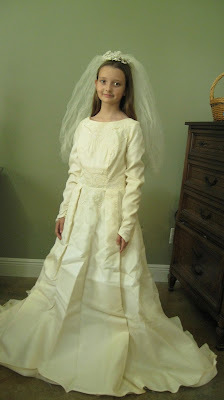 Then Mom Sarah reiterated that a wedding would be far into her 10-year-old offspring’s future--very, very far. And after Charlie showed her dad the picture of herself in the dress, did I really hear him say “She’s not going to date until she’s 36”? Baboo and granddaughter share a sweet moment. A Mississippi River pier in Baton Rouge, La. We headed for the city’s downtown area for a look at the Mississippi River from a beautifully developed section of the levee. Families, couples and individuals were enjoying the mild weather. They were picnicking, cycling, walking, jogging or just relaxing in colorful Adirondack chairs. As time slipped away from us, Hubby suggested I head back toward the pier’s entrance while he captured a few more images. At the junction of pier and levee, I took a few moments to plot a route from the security of the pier’s railings to sturdy objects that would give me a chance to hold on and make sure of my balance before continuing. I had my trusty hiking stick, but my lower left leg and foot had started exhibiting new quirks months earlier. It may be time to consider using a walker. But that decision is for another day. I stepped away from the pier railing and took a couple steps toward my next target. At that moment a strong squall hit. The wind almost knocked me down. I managed to turn around and retreat toward the pier. I lurched to the railing and held on for dear life as the gusts buffeted, threatening to pry me loose. The happy ending was we were unhurt and barely damp when we made it to Theatre Baton Rouge. There we enjoyed our little thespian’s dancing and singing as part of the ensemble cast. When walking I'm usually focused on where to put my left foot next. I had noticed the dark clouds, evident in the photo above; but I didn’t give a thought to the possibility that they meant severe weather. And it was severe, though thankfully brief. I learned I must be much more aware of my surroundings. Pier from the east bank of the Mississippi River in Baton Rouge, La. The lines of this pier begged to be photographed. I was intrigued that a pier could bring me such joy. For readers who wondered where Hubby and I are now calling home, in the past 16 months we have had a downsized home built on wooded property we bought 15 years ago. It is less than a mile from our former residence. The downsizing is a major step toward our goal of living more simply. February 20, 2016. Subway tile backsplash goes up in our all purpose room: kitchen, dining, hanging out. After the months of decisions, decisions and more decisions, we moved in about two months ago. We are loving it, even though we still face many more decisions about disposition of possessions, photos and paper accumulated in nearly 49 years of marriage. Hubby had an idea last month that we both embraced with a relieved sigh. We set a six-month moratorium for ourselves on any purchases for the house other than those absolutely, positively critical to our well being. We are repurposing and using furnishings, linens and other necessities of living for six months. Hodgepodge décor it is! A little more than four months remain. As new patterns are evolving in our new spaces, we are more confident that any future purchases will be in harmony with our home’s design and this season of our lives.